Why are US companies not investing? If consumption were absolutely flat companies would invest just enough to replace worn out fixed capital. It is only when consumption is growing that companies invest more than this. 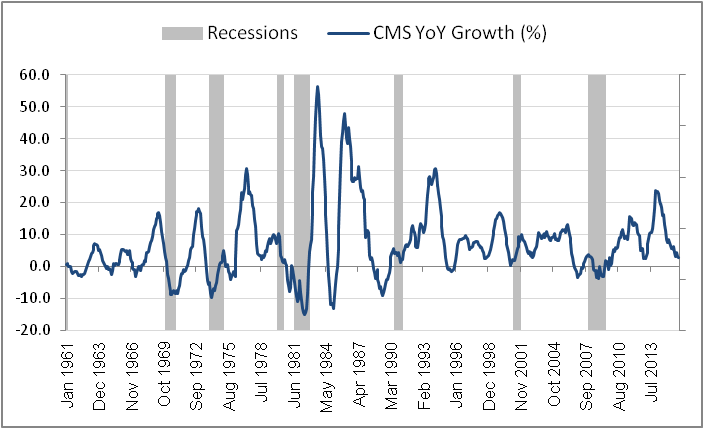 And when, as during and after a recession, consumption has fallen companies would not even seek to replace depreciated capital. This was what Paul Samuelson wrote about in his famous accelerator paper of 1939. Investment in Period t is a function of consumption in Period t-1. The graph below shows YoY change in Private Nonresidential Fixed Investment v/s YoY change in Personal Consumption Expenditure. There can be little doubt that it agrees with Samuelson's equation. Does raising the Fed Funds Rate raise inflation? The three graphs below show inflation (Consumer Price Index for All Urban Consumers) vs the Effective Federal Funds Rate for three periods: 1954 to 1975, 1976 to 2000, and 2001 to 2015. Readers are invited to judge for themselves which came first: the chicken or the egg. It is conventional wisdom that higher interest rates hurt the real economy because they raise the cost of loans and thus reduce the demand for them. This also explains the clamour for lower rates whenever the economy runs into trouble. It may therefore surprise economists to learn that the facts point the other way. The graph below shows the YoY change in Commercial and Industrial Loans (for all commercial banks) v/s the Effective Federal Funds Rate. From 1973 onwards it shows that commercial and industrial loans respond positively to a rise in interest rates. This may seem very odd. But the explanation is actually quite simple. Very low interest rates benefit the financial sector at the expense of the real economy. When interest rates are raised money moves from financial asset markets into the real economy. When the Fed sees this effect it concludes that money supply is expanding and continues to raise rates, when what is happening is quite the opposite (as my previous post showed). At a certain point in the upward trajectory of interest rates the financial asset markets collapse leading to a recession. The Dow is at a two-month high, oil prices are much above their recent lows, and job creation in the US has outdone all expectations. Unfortunatey, the monetary data remain as gloomy as ever. The Year-on-Year growth of Corrected Money Supply was 2.9% on 1 January 2016, the first reading after the rise in the Fed Funds Rate in December 2015. The data for previous months have been revised. Our last post in December showed money growth at 2.8% in October. That has now been revised to 3%. But growth is still falling steadily though at a slower pace. If the fall continues we may expect a major crash in asset markets by the end of this year. My book Macroeconomics Redefined explains how Corrected Money Supply is defined.